In the spring of 1941 war was already underway in Europe and it seemed increasingly imminent across the Pacific as well. With this in mind Admiral Ben Moreell, Chief of Navy Yards and Docks contacted the George A. Fuller Company in Quonset Point, Rhode Island. He gave them the task of designing a strong, versatile structure that could be shipped anywhere in the world. As an added challenge it had to be built using only basic tools by personnel without construction experience- and he needed it in 60 days! 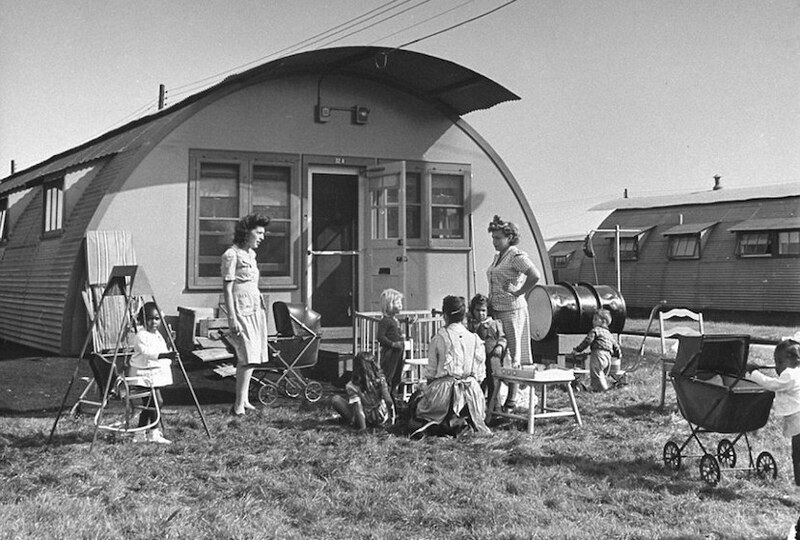 The Fuller Company assembled its engineers and drawing inspiration from the British Nissen Hut and modern industrial design materials of the Bauhaus, the Quonset Hut was born. The original design was 36′ by 16′ with a 8′ radius at its end. The arch shape of the hut meant it could withstand high winds and weight while still using relatively lightweight materials of the day. For those materials steel ribs were used for framing, galvanized corrugated steel was used for the outer covering and ply wood end walls that had doors and window were at either end. 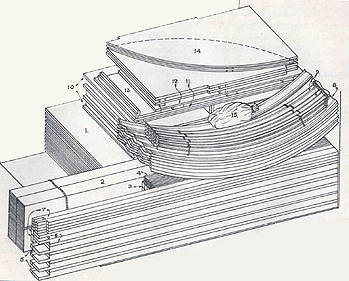 A further example of its adaptability the Quonset hut could be built atop stilts, concrete or a wooden floor. Later designs repurposed the shipping pallets as the floor itself. The Fuller team was so confident with their design that they began production before the Department of the Navy officially accepted the design. After the U.S. entered the war, the U.S. Army made an order for 16,000 units. Eventually over 150,000 would be made for and utilized by all branches of the service. As the huts were used throughout the world in the various theaters of combat, the Quonset huts was used for everything from barracks to bakeries and everything in-between. The design was so versatile, it was scaled up to a 20′ by 48′ and a 40′ by 100′ version that could be used as a hanger nicknamed the Elephant. G.I.’s around the world from Pacific Atolls to the snowfields of Alaska lived, ate and watched movies in Quonset Huts. 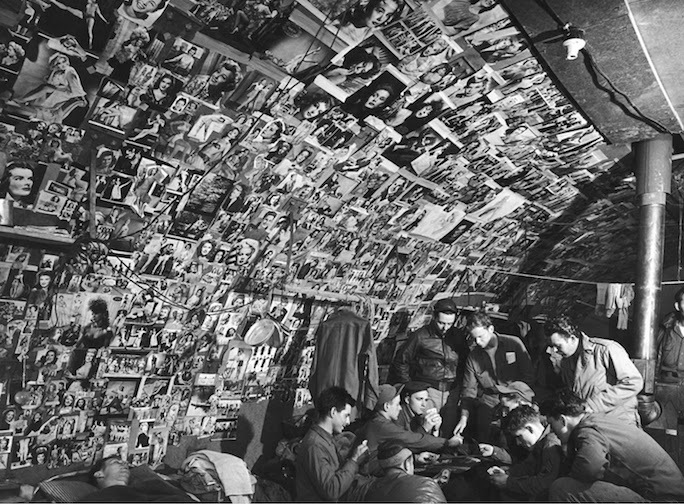 Even though they were often repeatedly torn down and reassembled to move with the changing frontlines, the ever creative American servicemen had the habit of customizing their Quonset huts to make them more comfortable such as building thatched porches in the Pacific Theater and plastering the inside walls with their favorite Pin-ups. After the peace was won, populations shifted and there was a lack of housing. Once again Quonset Huts quickly filled a need and were used for housing and school buildings as the baby boom took off and G.I. Bill benefits were used by veterans. In Griffith Park, Los Angeles an entire neighborhood was built using Quonset Huts called Robert Young Village. The village housed WWII Veterans and their families until the 1950s as the post war housing boom in Southern California finally caught up to demand. Now it is the site of the L.A. Zoo. In 1955 music history would be made in Nashville when Harold and Owen Bradley set up a recording studio in a surplus Quonset Hut. The curved walls produced really good sound and some of Country Music’s greatest artist recorded there including Patsy Cline’s famous song “Crazy” (penned by Willy Nelson) Other famous acts such as Gene Vincent, Bobby Vinton, Johnny Cash, Tammy Wynette and later rock n’ roll artist Bob Dylan and Elvis Costello recorded under its arched roof. 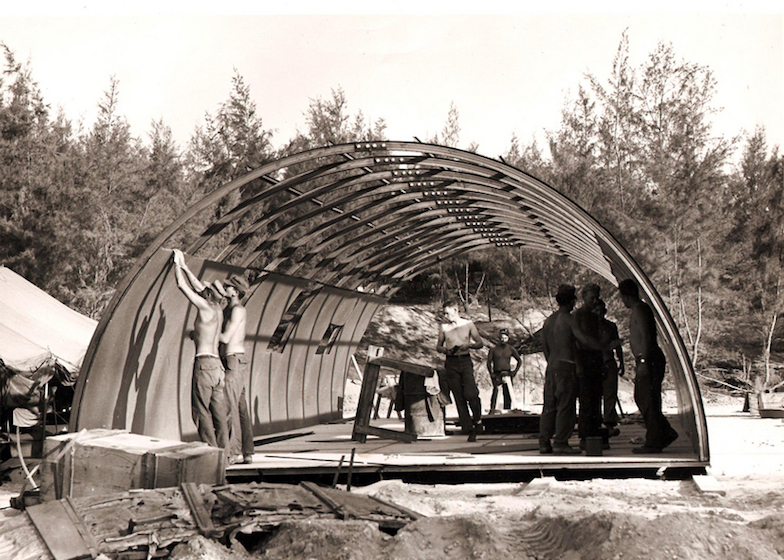 Over 70 years later, original Quonset Huts are sill in use and the design has continued to evolve and be used by steel builders for barns and has been re-discovered by Modern Architecture and pre-fab builders as what else? – a strong and efficient structure that can built practically anywhere.